Identification: Adults are light green or brown; they have lustrous eyes, long antennae, and heavily veined wings. Larvae look like tiny alligators with sickle-shaped jaws. Adults hold wings in tent-like fashion while at rest. Some species have prominent golden eyes. Brown lacewings are smaller and their eggs are not stalked. 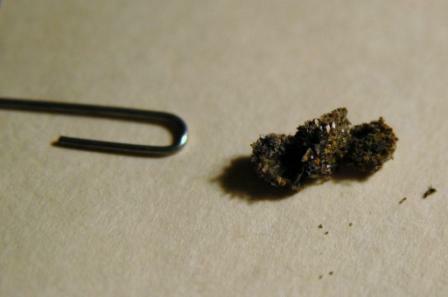 Complete metamorphosis--eggs, larvae, pupae, and adults. Adults normally feed on nectar and honeydew or possibly take no food. 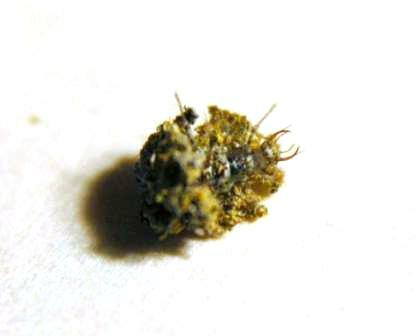 Larvae are ferocious predators of many insect pests. Adults are active fliers at night. Females lay several hundred eggs in spring and summer. 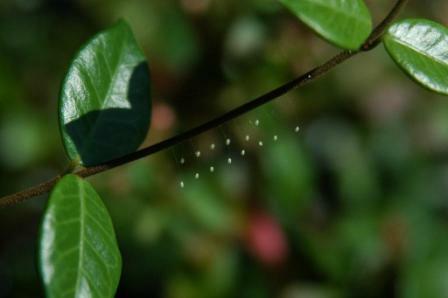 Eggs of the green lacewing are connected to the end of long silk stalks, singly or in clusters, on limbs, twigs, leaves, or even inorganic objects. 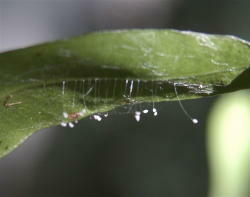 Brown lacewing eggs are not on the silken stalks. 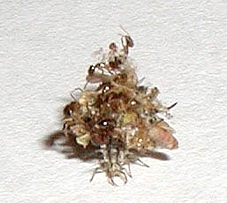 Larvae are pinkish brown and very mobile, progressing through three instars in two to three weeks. They pupate in silken cocoons attached to underside of leaves and emerge in about five days by cutting a hole in the cocoon. Overwinter as adults or cocoons. Three or more generations a year. Habitat: All gardens and naturally maintained areas. Vegetable and ornamental crops are host plants. Feeding habits: Larvae or "aphid lions" feed on aphids, thrips, mites, mealybugs, scale, whiteflies, eggs of leafhoppers, moths, cabbage loopers, corn earworms, Colorado potato beetles, asparagus beetles, leaf miners, and several other small caterpillars and beetle larvae. Developing larvae eat from 100 to 600 aphids a day. Economic importance: Control of many troublesome insects. One of our most important beneficial insects. Organic control: None needed; should always be encouraged. 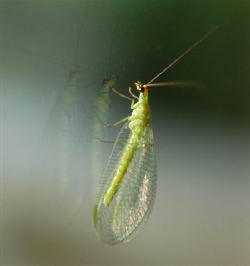 Insight: Green lacewings are one of the most effective beneficial insects. They are fragile-looking insects that fly around, look pretty, and mate. Nice life! The lacewing's larvae are the hard workers. They are voracious eaters of aphids, red spider mites, thrips, mealybugs, cottony-cushion scale, and many species of worms. The larvae are called aphid lions or ant lions. Larva and eggs can be purchased commercially. Use at least 500 to 1,000 eggs per release in the average garden. 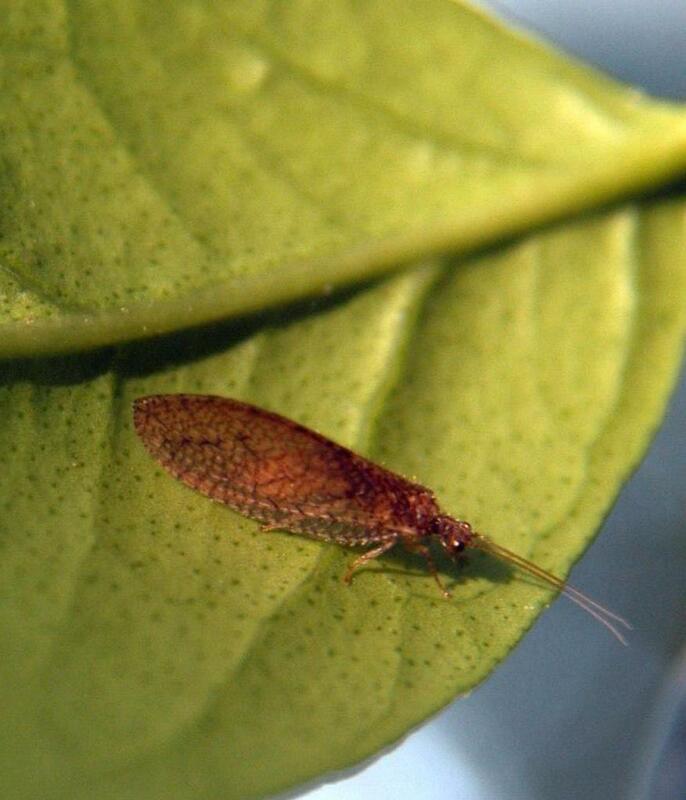 To store lacewings prior to release, refrigerate the eggs or larvae for a few days at 38Ð45 degrees Fahrenheit, which will delay development but not hurt the eggs. Do not freeze. Green lacewing adults, eggs, and larvae can be hand-sprinkled wherever harmful insects exist or are suspected. Larvae and eggs are the most practical to use. Even put in the wrong place, they will travel 100 feet if necessary for their first meal. A pill bottle with a quarter-inch hole in the cap is a good device for distributing the eggs. A salt shaker will work if the size of the holes is slightly increased. 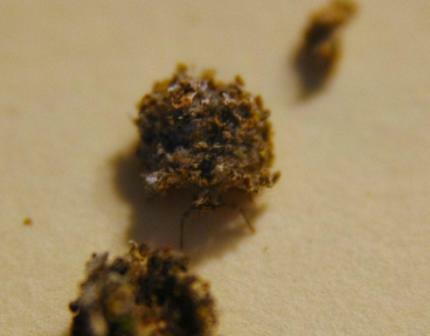 Lacewing eggs are very small. A thimble will hold about 10,000 eggs. Watch out for fire ants; they will eat the eggs like jelly beans. Biweekly releases of 2,000 to 4,000 eggs per residential lot or per acre is ideal.